Hard Cover, 250 pages, 6.25 x 9.00. For millions of beer lovers the world over, a properly poured pint of Guinness Stout is as close to perfection as beer gets. Each year, fans of the legendary black liquidation enjoy two billion pints of the beer known for its distinctive creamy head and rich drinkability. Ireland's most famous export, Guinness Stoutand the people who have brewed ithold a unique place in the history of beer, business, and Ireland itself. They say that good things come to those who wait. 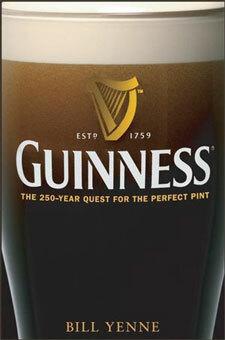 When you wait on a perfectly poured pint of Guinness Stout, you know you're getting something good. It's more than just a pint of beer; it's a mouthwatering visual presentation of the quality and taste you're about to enjoy. And millions wait patiently for their pint every day. To find out why, famed beer and beverage writer Bill Yenne talks to everyone from Guinness's master brewer to typical pubgoers about the beer they hold dear. Whatever magic makes it so delicious, it's powerful enough to soothe the souls of beer lovers from Dublin to Boston to Buenos Aires to Lagos, and everywhere in between. But Guinness is more than a delicious beverage, it's also the name of the remarkable family of brewers and entrepreneurs whose story is worthy of legend, and who occupy a prominent place in Irish history. In Guinness, Yenne traces the 250-year tale of the family and its namesake beer. Beginning with Arthur Guinness, the entrepreneur patriarch who first began brewing at St. James's Gate, Dublin, in 1759, the story follows succeeding generations of the Guinness family through the years. Yenne follows not just the fortunes of the family Guinness, but also the development of the brand and the beerfrom Arthur's earliest porter to the beer that is enjoyed in 150 countries today. Prologue: The World's Greatest Beer. Introduction: What is Guinness Stout? Chapter 2. Arthur Guinness, Brewer. Chapter 3. A Family Business. Chapter 4. Generations and Dynasties. Chapter 5. Bottlers and the Export Trade. Chapter 6. Building Sales While Building Rails. Chapter 7. A Public Company. Chapter 8. The Guinness World Travellers. Chapter 9. To the Ends of the Earth, and Manchester Too. Chapter 10. War at Home and Abroad. Chapter 11. Trouble, Triumph and the Toucan. Chapter 12. Brewed in Britain, and America Too. Chapter 13. World War II. Chapter 14. The Postwar Years. Chapter 15. Great Men and Great Ideas. Chapter 16. A Family Business at Two Hundred. Chapter 17. Nitrogenation, the Really Great Idea. Chapter 18. A Lager Called Harp. Chapter 19. Into Africa, Malaysia and Beyond. Chapter 20. Diversification and Expansion. Chapter 21. The Watershed Decade. Chapter 22. A Widget in the Pint. Chapter 23. A Growing Company and The Perfect Pint. Chapter 24. Guinness in the Twenty-First Century. Chapter 25. Inside The Gate With The Master Brewer. Epilogue: The World's Greatest Beer. Bill Yenne has been writing extensively about beer and brewing history for two decades and has discussed these subjects as a featured guest on the History Channel. He is the author of more than forty books on a variety of historical topics, and a member of the American Society of Journalists and Authors.